Fans of "Dawson's Creek" likely spent much of the late '90s and early '00s rooting for the success of James Van Der Beek's onscreen romance with his TV love, Joey (played by Katie Holmes). In real life, however, James Van Der Beek's love is his wife of eight years, business consultant Kimberly Brook. Van Der Beek and Brook, who is his second wife, have been married since 2010 and have five young children together: two-year-old Emilia, four-year-old Annabel Leah, six-year-old Joshua, seven-year-old Olivia, and baby Gwendolyn, who was born in June. So, on the surface, it might appear as if the couple's path to large, happy family was smooth and without any bumps in the road. In a candid Instagram post this weekend, however, Van Der Beek revealed that that is far from the case. Not only did he and his wife experience the pain of miscarriage – they went through it three times. And those painful experiences led him to a number of insightful takeaways that have now sparked an important and emotional discussion among thousands of men and women on the platform. "First off -- we need a new word for it," Van Der Beek writes in the post. "'Mis-carriage,' in an insidious way, suggests fault for the mother -- as if she dropped something, or failed to 'carry.' From what I've learned, in all but the most obvious, extreme cases, it has nothing to do with anything the mother did or didn't do. So let's wipe all blame off the table before we even start." Van Der Beek may not be a doctor, but he's right about how many women who suffer miscarriages incorrectly feel that the loss of the baby was somehow their fault. A 2015 study found that, among those who had a past miscarriage, almost half said they felt guilty, 41 percent said they felt they did something wrong and 28 percent felt ashamed. More than one-third thought they could have prevented their miscarriage, despite the fact that this is rarely the case. "Second... it will tear you open like nothing else," Van Der Beek continues in his post. "It's painful and it's heartbreaking on levels deeper than you may have ever experienced. So don't judge your grief, or try to rationalize your way around it. Let it flow in the waves in which it comes, and allow it it's rightful space. And then... once you're able... try to recognize the beauty in how you put yourself back together differently than you were before." The "Varsity Blues" star then goes on to reference a few of the things that brought he and his wife a bit of peace in the months after their various miscarriages. And he effectively issues a callout for others to do the same in the comments below. "Many couples become closer than ever before. Many parents realize a deeper desire for a child than ever before. And many, many, many couples go on to have happy, healthy, beautiful babies afterwards (and often very quickly afterwards -- you've been warned ). I've heard some amazing metaphysical explanations for them, mostly centering around the idea that these little souls volunteer for this short journey for the benefit of the parents ... but please share whatever may have given you peace or hope along the way ... Along with a new word for this experience. 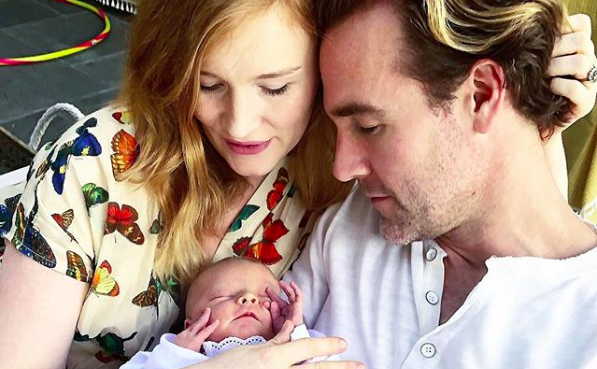 #miscarriage #WeNeedANewName #MoreCommonThanYouHearAbout"
Van Der Beek's final hashtag -- #MoreCommonThanYouHearAbout -- may very well be the crux of why his post has struck a chord with so many. "Miscarriage seems to be unique in medicine in being very common yet rarely discussed, so that you have many women and couples feeling very isolated and alone," says Dr. Zev Williams, a professor of obstetrics and gynecology at Albert Einstein College of Medicine and Montefiore Medical Center in New York City and the co-author of the miscarriage study referenced above. "In our study, when family, friends, public figures or celebrities revealed their miscarriage experiences, it helped reduce the feelings of isolation." By the time of this article's publishing, Van Der Beek's post has already garnered nearly 70,000 likes and thousands more comments from women across the globe, who have finally been given a venue to discuss their all-too-common and all-too-secret personal tragedies. One can only hope that the existence of such a venue and the honesty of Van Der Beek's post offer them some degree of healing.